Early this month, Hurricane Matthew , the worst storm to strike Haiti in more than 50 years, left a wake of destruction in the still recovering island nation. While Matthew made headlines and has brought into focus existing issues such as the cholera epidemic and Haiti’s election delays, the ongoing plight of Haitian migrants traveling to the U.S. has gone largely unnoticed. In fact, over the past year, a steady and increasingly large influx of Haitian migrants has sought entry to the U.S. via the San Ysidro entry port in Tijuana, Mexico. 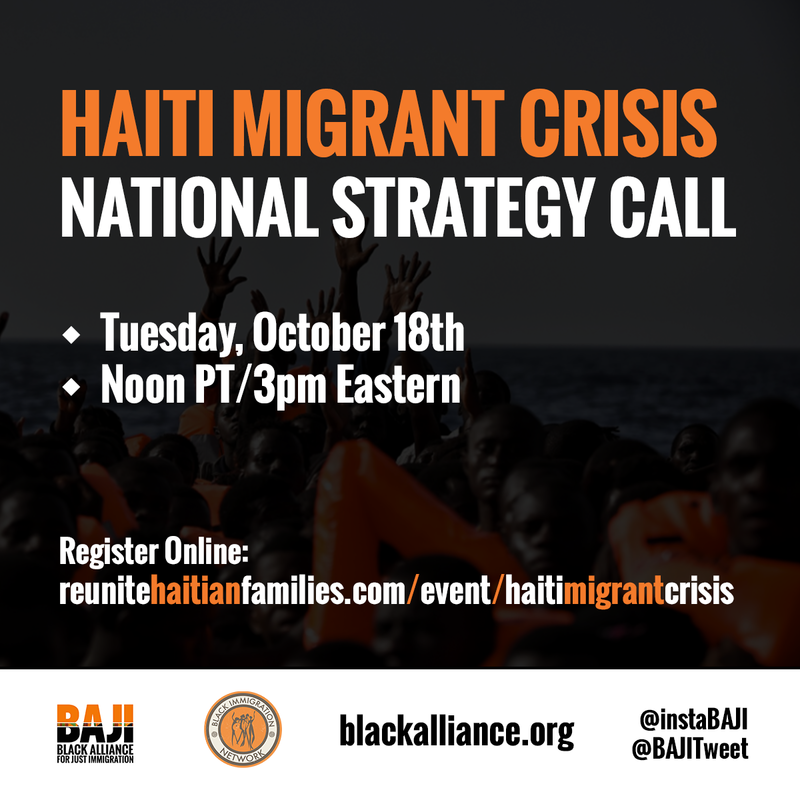 Please join BAJI and BIN members for a call on Tuesday October 18 to learn more about the crisis facing Haitian Migrants at the U.S.-Mexico border and how you can help. Most migrants are making a treacherous, 7,000 mile trek from Brazil, where an estimated 40,000 Haitian’s sought work and refuge on special visas following the 2010 earthquake. They are now displaced due to the changing economic and political conditions. While the U.S. government had initiated a humanitarian entrance for this population, the Department of Homeland Security has recently decided to reverse this policy, resuming deportations to Haiti and onlysuspended that decision due to the damage following Hurricane Matthew.BAJI and the Black Immigration Network are determined to stand up for Haiti and Haitian migrants in crisis. Join the call tomorrow to hear from groups on the ground, understand what the needs are and prepare to take action. USCIS has announced that the next round of invitation to the HFRP Program will take place in mid- to late November 2015. HFRP Program: The HFRP Program allows certain eligible Haitian beneficiaries of family-based immigrant visa petitions approved on or before Dec. 18, 2014, to be paroled into the United States before their immigrant visa priority dates become current. Once paroled into the United States, these beneficiaries will be able to apply for work permits while waiting for their immigrant visas to become available. Once their visas are available, they can apply for lawful permanent resident status (Green Card). Invitations for the HFRP Program: Invitations will be sent to petitioners of Forms I-130, Petition for Alien Relative, that were approved on or before Dec. 18, 2014, if the immigrant visas for their beneficiary relatives in Haiti are expected to become available within approximately 18 – 36 months. The invitations will provide important information petitioners should consider as they determine if the program is right for them and their eligible family members. It will also include instructions on how to apply to the program. Only individuals who receive an invitation will be eligible to apply for the HFRP Program on behalf of their family members. For additional information on the invitation process, please see uscis.gov/HFRP. If you believe that you may be eligible for this program, please ensure that the Department of State‘s National Visa Center has your most current mailing and email address. You may update your mailing address by emailing the National Visa Center (NVC) at asknvc@state.gov or by completing the Public Inquiry Form on the NVC’s website atwww.travel.state.gov. To learn more about the HFRP Program, please visit uscis.gov/HFRP. As the Haitian Family Reunification Parole Program begins to be implemented, having the correct information about the program is key. The USCIS has created a site with resources in English and Kreyol, to better understand the program details, encourage those who might be eligible to update their contact information and warn against fraud and scams. Share these links with your networks and encourage them to only trust information from official sources. On this call you will hear from Reunite Haitian American Families Campaign co-chairs, Ninaj Raoul of Haitian Women for Haitian Refugees and Marleine Bastien of Haitian Women of Miami, about what the creation of a Haitian Family Reunification Parole (HFRP) program means to thousands of families across the country who will finally be reuniting with their loved ones as a result of this victory. We will also share basic information about HFRP implementation. Finally, Nicole Lee will provide an assessment of how the campaign can best move forward and next steps in advocating for Black immigrant issues at the policy level.Don’t miss out on this inspiring and informative call. Today marks the 5th Anniversary of the world’s worst natural disaster left more than 300,000 dead and an equal number injured. Five years later, recovery and aid efforts have made slow, uneven progress. and there are more questions than answers. This anniversary is a sobering reminder to all that families in Haiti are still struggling and we must do all that we can to assist. The Reunite Haitian Families Campaign urges a fully implemented Haitian Family Reunification Parole program be implemented to speed recovery efforts, reunite families on years long waiting list and provide much needed relief to thousands still struggling as the economy and infrastructure are rebuilt. Sign and share the petition and add your organization endorsement to the campaign today! This video report by the Miami Herald shares a compelling update on the status of recovery in Haiti and why we must continue to fight and work together for the resilient, strong families rebuilding their lives after this tragedy. On October 17, 2014, U.S. Citizenship and Immigration Services (USCIS) announced a limited Haitian Family Reunification Parole Program to help unify families and promote safe, legal and orderly migration from Haiti. However, this program will not begin until early 2015. Until then, we strongly urge Haitians who may want to apply under this program to be careful of immigration scams. Dishonest people may try to trick potential applicants and take their money by saying they will help them apply. No one can apply for the program until it begins early next year. Those Haitians who will be eligible for consideration under the program will be contacted in writing with information on how to apply. We will post announcements on www.uscis.gov and inform the Haitian community when we start this program. Please read our newest flier, available in English, French and Haitian Creole, about how to avoid immigration scams and share it with your friends and family members. To learn more about common scams and where to report scammers, and how to find authorized assistance with immigration services, please visit www.uscis.gov/avoidscams. [New York, NY – Friday October 17th, 2014] Advocates of the Reunite Haitian-American Families Campaign have achieved a significant victory in the October 17th Department of Homeland Security announcement of a Haitian Family Reunification Parole Program (HFRP). Prior to this federal announcement longstanding support for FRPP grew from key national efforts like the Reunite Haitian American Families Campaign that is sponsored by the national coalition Black Immigration Network, which includes organizations such as the Black Alliance for Just Immigration (BAJI), Haitian Women for Haitian Refugees and Haitian Women of Miami. President Obama plans to announce executive actions regarding immigration tailored to Hispanic needs, a key demographic. While that’s smart substantively and politically, his neglect of a key Haitian-American goal may lower voter turnout next month. The president has so far ignored more than 80 significant calls since 2010 for the Department of Homeland Security (DHS) to create a Haitian Family Reunification Parole Program (FRPP), like a recently renewed Cuban program, disappointing Haitian Americans previously upset when related 2012 campaign promises weren’t met.